Have you lifted your Jeep and now have driveshaft vibration problems? Install this Slip Yoke Eliminator kit and reduce or eliminate that annoying noise and vibration. Transfer case tailshaft length is reduced by 6.5" on '97-'03 TJ Wranglers and '96-01 XJ Cherokees, and 4.25" on '88-'95 YJ Wranglers and '87-'95 XJ Cherokees, reducing the driveline angles. 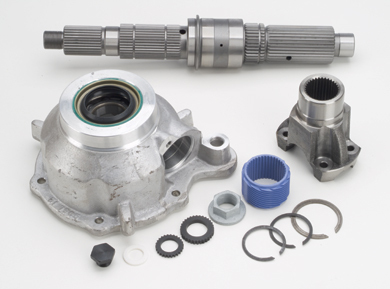 Kit comes with a heavy-duty rear output shaft which is shorter and has 18% larger spline diameter and a 54% increase in torque capacity. New aluminum rear output housing, bearings, seals, snap rings, bolts and instructions. *Some YJ and XJ models may require mode fork shift rail to be shortened. TJs may need adjustable rear arms or cam-bolts to set pinion angle. YJs and XJs may need leaf spring shims to set pinion angle.